We replaced the shoulder bolt on the pivot point with a turned steel shaft. The shaft has a hex end instead of a traditional bolt head. This allows you to remove the drive plate without removing the shaft, saving time and making it easier to remount. In addition, the shoulder bolt was .495in in diameter. The new turned shafts are .4995in +0.0/-0.0005in and fit much tighter in the pivot bearings. This removes flex at the pivot point. We redid the CAM tension for the timing belt. It now turns independently from the screws and is easier to adjust. 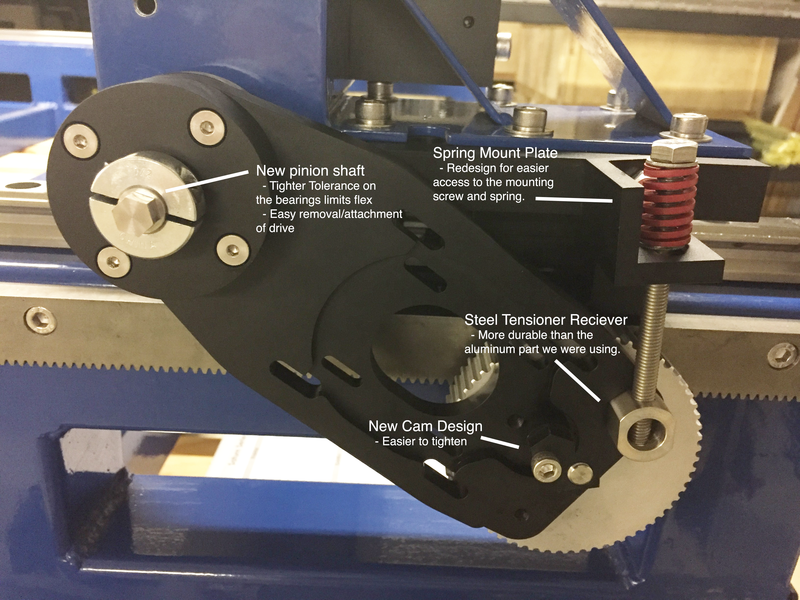 We remade the tensioner receiver in steel instead of aluminum. We have had some reports of this part stripping threads. The change to steel should solve that problem. We redesigned the tensioner mount to allow access to the mounting screw. This allows you to fully tighten it down after the spring is in place and tensioned. The screw is transitioning to a hex head screw to enable access with a wrench.